Regardless of your particular legal issue, if you are looking for an attorney, it is extremely important to work with a lawyer who understands your legal issues and has the experience to help you obtain the results you need in your case. 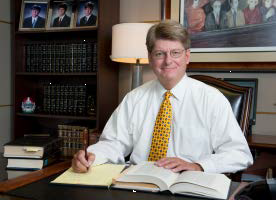 With 40 years of legal experience serving Mobile and all of Southern Alabama, I have handled a wide range of legal issues. The breadth and variety of my legal experience gives me a strong understanding of the law, which helps me see how my clients’ legal choices will impact them for years to come. You can come to me with almost any type of legal matter, and I can help you. I have served as an Arbitrator who actually decided the outcome of various type of disputes. I have been accorded this responsibility and honor because all of the lawyers involved agreed they wanted me to hear the evidence, review the law, decide the outcome, and issue a written ruling. Business law and litigation: I help clients in all aspects of their business, including entity formation and startup, ongoing contract negotiation and drafting (Business / Stock Purchase Agreements, deeds, leases, non-compete agreements, etc. ), disputes and litigation as well as real estate issues. Probate, Elder Law and Estate Administration: I prepare Wills, Powers of Attorney, Trusts, and help clients create comprehensive estate plans, probate and estate and resolve probate disputes through negotiation, mediation and litigation. Personal injury and wrongful death: I have a wealth of experience representing plaintiffs and defendants in all types of personal injury and wrongful death claims, including motor vehicle accidents, industrial accidents, premises liability and product liability claims. Employment law for employers: I represent employers, ranging in size from small, closely-held businesses to international concerns, in all types of legal matters including drafting handbooks and policies, advising companies regarding terminations and reductions in force, facilitating employment dispute resolution, preventing and defending discrimination and Civil Rights claims, and handling matters with Federal and State agencies including Equal Employment Opportunity Commission, Alabama Department of Industrial Relations, National Labor Relations Board, Occupational Safety and Health Administration and United States Department of Labor. As a solo practitioner with 40 years of experience – including as a Partner working in a large law firm, handling major corporate litigation – I am able to provide all of my clients with the benefit of my experience with the efficiency and personal service that comes with a one-attorney operation. I am also a certified mediator and arbitrator, registered on the Alabama State Court Mediator Roster and selected by the EEOC to mediate Charges of Discrimination filed with that Federal agency. Through a range of alternative dispute resolution (ADR) options, I am often able to save my clients time and money by avoiding the courtroom litigation process which can be costly and go on for years. To talk about your legal matter with an experienced attorney, call me at 251-432-0011 (866-265-9640 toll free) or email me today.